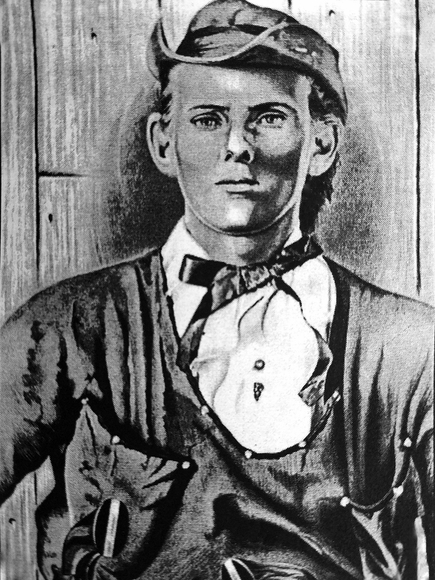 Jesse James was born on September 5, 1847, in Kearney, Missouri. His older brother Alexander Franklin “Frank” James was born three years earlier. Their father Robert was a hemp farmer and Baptist minister who helped found William Jewell College. During the Civil War Frank joined the Confederate Army. At the time he was only 16 years old, but Frank saw extensive action. His battlefield experience included the horrific Battle of Wilson Creek. When Frank returned home he was arrested by Union soldiers. The soldiers stopped just long enough to beat Jesse senseless. After recovering from his injuries Jesse joined the outlaw gang that was headed by William Clark Quantrill. Then when Frank was released on parole he and his cousins Jim and Cole Younger also joined the gang. Soon afterward the Younger home was burned and their father Colonel Henry Younger was murdered by Union sympathizers. The Younger brothers were irate. They decided to seek revenge for the murder of their father by attacking Lawrence, Kansas. At this time Quantrill's raiders numbered 450 men and all of them were heavily armed. On August 20, 1863, they attacked Lawrence, killing 142 men. The town was destroyed. In addition they issued “Order No. 11” that ordered the counties of Bates and Jackson to depopulate and their homes and crops burned. The residents reluctantly complied out of fear for their lives. Quantrill was killed by Union soldiers in 1865. At this time the James brothers formed their own gang with the Younger brothers. Together they began plotting a series of robberies that would soon make them famous. They first struck on February 14, 1866, by robbing a bank in Liberty, Kansas, of over $15,000 in gold coins. On the way out of town the gang committed their first murder when they shot a 19 year old college student. The James gang would next commit a series of bank robberies in both Kentucky and Missouri, netting large amounts of cash in each heist. It was at this time that they decided to commit the second train robbery in the history of the United States. On July 23, 1873, they robbed what turned out to be the wrong train in Council Bluffs, Iowa. However, the robbery resulted in a cash haul of $7,000. They next derailed a train in Gads, Missouri, forcing the entire population of the town into the train depot and holding them hostage until the robbery was complete. Then 18 month later, Pinkerton detectives attacked the farmhouse of Jesse and Frank's mother and step father, by throwing a bomb filled with flammable liquid into their home. The blast tore off their mothers arm and killed their 8 year old step brother. This act was denounced nation wide. A short time later the gang made their biggest haul by robbing the Kansas Pacific Railroad of $60,000. However, their next robbery would not go smoothly. This time they tried to rob a bank in Northfield, Minnesota, but the town was waiting for them. As soon as they arrived in town, both sides exchanged gunfire. Defeated, the gang rode out of the town with 1,000 men on their trail. The brothers managed to escape, took on new names, and moved to St. Joseph, Missouri. At this time there was a $10,000 reward for their capture dead or alive. Before long two members of their gang named Bob and Charles Ford turned on Jesse for the reward money. They killed Jesse by shooting him in the back. Frank was arrested and pardoned. He then participated in the Frank James- Cole Younger Wild West Show. Frank died on February 18, 1915, at the age of 72 of natural causes.